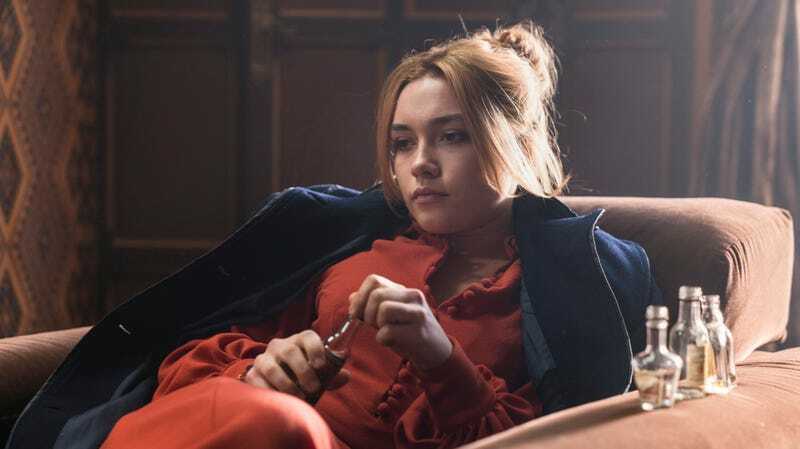 In its first two episodes, The Little Drummer Girl has elided the moral dimension of the main action. It’s a structural necessity as it’s important to establish characterization through process before addressing the political, but waiting until “Episode 3” to ask the question, “Is this wrong?” also makes thematic sense. Charlie, Kurtz, Becker, and the rest of the team have a capital-J Job to do, and while Park Chan-wook and writer Michael Lesslie have not exactly hidden the harsh nature of their work, there isn’t really a moment to dwell on ethics. But like the ticking bomb that opens the series, the uncomfortable realities will eventually rear their ugly head, and possibly take down many lives as well. Written by Claire Wilson, “Episode 3” is The Little Drummer Girl’s finest hour so far, both narratively and aesthetically. Sporting a bifurcated structure, its first half follows Charlie’s riveting road-trip adventure to Gutigplatz Square in Kleinalm so Kurtz’s team can capture Anna Witgen, the au pair who planted the bomb in the attaché’s house. The second half, however, operates in a more muted register as the Kurtz team collectively decides to murder Salim and Anna, while Charlie finds herself wracked with guilt as the line between fiction and reality becomes permanently blurred. It’s a nasty episode, one that initially delivers fun and then recontextualizes it in a much harsher light. Contrast the shot of Charlie goofily singing along to the radio in a car packed with explosives against the lonely shot of that same car going up in a ball of fire while two people burn inside. Everything comes with a price. “Episode 3” initially moves at a steady clip, which is crucial to its cumulative power. As Becker sends Charlie on her way to Salzburg, Kurtz and the team realize that Salim had lied to Shimon about the car’s final destination. Kurtz eventually gets the truth out of him by adopting the good-cop approach and releasing Salim from the isolation chamber. Kurtz excels at giving off the vibe of a gentle, scholarly uncle, but his tactics are much more insidious: A miniscule act of kindness after 10 days of dehumanizing treatment was bound to produce results, especially considering Salim’s youth. It’s telling, however, that Kurtz’s initial attempt to bond with Salim over their shared childhood in respective “camps” doesn’t remotely faze him. “Then you are worse than any of them,” Salim sneers in response. Rachel interrupts Charlie’s road trip to communicate the new location, and the job goes well save for a couple stumbles involving the Austrian border and Charlie’s absentmindedness vis-à-vis lighting cigarettes in the car/smuggling booze. Her efforts lead to Anna’s capture, but it also brings her closer to Becker as she navigates the muddy romantic waters between him and “Michel.” Becker’s profession circumscribes his vulnerability, and any time he shares emotion with Charlie, it’s primarily under the guise of the Michel persona. Yet, in this episode, his feelings finally bubble to the surface, even if it takes the form of a comforting hand on Charlie’s face or carrying her to bed after she falls asleep in the bath. Naturally, this throws Charlie for a loop, and her staunch romantic detachment slowly starts to crumble, even if it’s unclear with whom she’s falling in love. Her divided affection climaxes in a scene when she comes on to Becker while he’s reading her the doctored love letters from Charlie to Michel. She kisses him, pushes him onto the bed, and mounts him, but eventually Becker’s face disappears and Michel’s takes its place. She looks up to see Kurtz and his team around the bed as they watch Charlie “fulfill her role,” so to speak. Kurtz’s operation has wormed her way into her brain. She falls for Michel’s words and Becker’s body, even though the two are at ideological opposed. Naturally, it’s a product of impulse and delusion, which Becker picks up immediately, but Charlie mind has been compromised. Even Becker’s reassuring embrace can’t change Charlie’s knowledge of the operation. Mind you, her clumsy pass follows Kurtz’s reveal to her that they’ve captured the real Michel. He presents his naked body to her so she can memorize birthmarks in case she’s contacted by the network in London, and the stark reality of her participation finally takes form. She immediately sours on the whole affair and throws her objections in Becker’s face. “You can’t have it both ways: Victim one day, tyrant the next,” she tells him as Becker tries to justify their collective actions, eventually throwing the Munich Olympic deaths in her face. For Kurtz and Shimon and the rest of them, their actions amount to an eye for an eye. After all, Salim and Anna killed an eight-year-old boy who wasn’t supposed to stay home from school. But for Charlie, violence just begets more violence, and now she’s a part of it. Park’s direction is the episode’s true MVP, and while he has a handful of truly stellar moments this hour—the sexually charged reunion between Charlie and Becker in the Munich hotel room, filmed in a single take that never calls attention to itself; the wide shot of Anna’s capture on the side of the highway, which only ratchets up the violence and cruelty; the Mercedes crashing into the guardrail over the insert of Michel’s letter; the burning car reflected in Kurtz’s glasses; etc.—his finest visual choice might be Kurtz and Becker facing off in the motel room. Park frames them against the depression in the ceiling, which literally halves the room and allows for Shannon and Skarsgård to hide from the other. Despite his bluster with Charlie, Becker infiltrates Kurtz’s conscience regarding the impending double murder. He never goes out of his way to make a strong objection, but he transfers his guilt to Kurtz anyway. Kurtz insists there’s no other way, but him and Becker know the truth: There’s always another way. This one is just cleaner. In the episode’s final act, Charlie sits in her London apartment, stewing in paranoia, and reads Michel’s fake letters with genuine sympathy for his plight. While Charlie’s loyalties fracture in real time, Kurtz’s team manufactures a car crash that will satisfy the Cologne government and exact revenge. Shimon leads the effort, but even his zealotry and rage hit a wall when faced with the task. Becker assists, advising Shimon that Anna should be in the driver’s seat because her instability makes the accident more believable. As Salim’s voiceover and Jo Yeong-wook’s score fill the soundtrack, we watch the car lose control and burn up on an abandoned stretch of highway. Shimon, Becker, Daniel, Rachel, and Rose watch nervously from the overpass, uncertain if their actions were just. Kurtz, satisfied with the outcome, leaves the motel after watching from a distance. “Terror is theater, and sometimes the world has to be lifted up by its neck before it will listen to justice,” explains Salim while a small band of Israelis commit an act of terror in secret. As Charlie knows very well, theater doesn’t require an audience. “Our bodies and bloods are mixed,” writes “Michel,” and by episode’s end, that idea becomes more than a mere notion. A parting shot of Charlie’s tear-stained face, bathed in dark red light that resembles blood, makes it clear that she’s no longer naïve, and she can no longer be absolved. Some key facts about Salim’s life, which are presumably accurate given the research skills of Kurtz’s team: He grew up in al-Khalil, or Hebron, one of the few places where Jews were never exiled. His father admired the Jews and wanted to form a common society, but the Zionists attacked him and his family, which destroyed any goodwill he had left. His grandfather had to sell his horse to buy a gun to protect his family, and he was shot with that very same gun. The quotation at the top comes from Salim, who watches children play outside the safe house and ruminates on the world’s indifference to his people’s plight. The song that plays after Charlie drops off Becker on the side of the road is Litsa Diamenti’s “Tha Sou Kano Kapsonaki.” It’s linked below.